I'm not sure why making this card didn't occur to me to make this card when I made the Jr. High basketball Prince basketball card. Nevertheless, here's a fun one inspired by that famous Dave Chappelle skit. This card is in the style of the 1987-88 Fleer basketball. 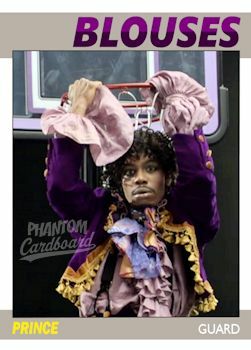 I wanted to use a design that had a team name but not a logo, although coming up with a basketball logo for the "Blouses" might have yielded a hilarious result. I liked that the team name calls for a two-tone so I can use two different shades of purple. When it comes to prince you really can't have enough purple. I've opened an online store that I'm going to be playing with and stocking in the weeks to come. If you'd like to own a copy of this you can get one here.